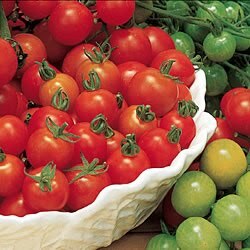 Fresh-picked cherry tomatoes add a sweet dimension unlike any other of the large tomatoes. Brandywine as a big slicer ranks a close second but a ‘Sweet 100’ or a ‘Sweet Million’ Cherry tomato usually tips the sugar content scale on the Brix test. This test measures sugar content in fruit and vegetables. So don’t let your cherry tomatoes split on the vine. The dynamic flavor and sweetness play off many other culinary ingredients. Here are four easy recipes for the weekend barbeques – strictly for these sweet Cherry tomatoes. Add shaved pecorino cheese (use a vegetable peeler) upon serving. Arrange on a plate and drizzle with balsamic vinegar syrup. This is balsamic vinegar reduced. (1 cup makes 1/3 of a cup of syrup boiled down). The final recipe uses leftover corn on the cob. Don’t let it go to waste. Wrap it up and put the corn in the fridge for the next day to make this hot and spicy salad. Toss and refrigerate for at least 1 hour prior to serving. This particular recipe goes great with anything smoked on the barbie! We wrap up our week with a simple quote by Lewis Grizzard. “It's difficult to think anything but pleasant thoughts while eating a homegrown tomato.“ Enjoy the sweetness of these final summer days. This is peak tomato season so don’t let it slip by without trying some of these simple culinary tips in your kitchen.